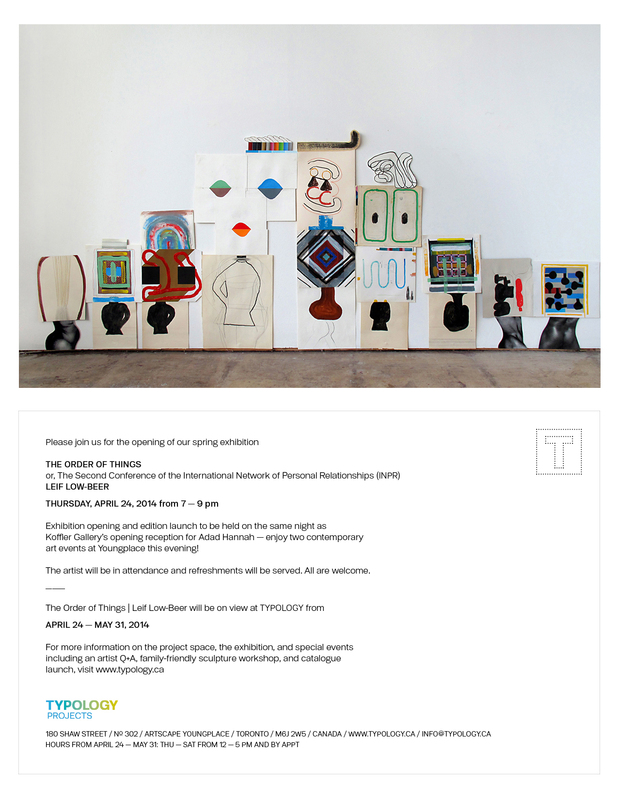 TYPOLOGY presents our spring exhibition, THE ORDER OF THINGS or, The Second Conference of the International Network of Personal Relationships (INPR). This exhibition features new and recent work by Leif Low-Beer (Toronto/Brooklyn), an artist who engages in a playful reordering of ideas, images, and expectations through the use of constructed, multi-part, and/or recombined compositions of drawings, collages, assemblages, and sculptural tableaux. The Order of Things is Low-Beer’s first solo exhibition in Canada. Evincing a keen interest in the mark of the hand, the relationships between objects in space, and the active engagement of the viewer, Low-Beer’s work is an exploration of psycho-spatial potential, graphing social tensions and internal enigmas that often exist as an underlying narrative layer. However, Low-Beer seeks to transcend fixed ideas or story lines in his work, preferring to create opportunities for meaning that can evolve and expand over time. A full-colour exhibition catalogue featuring an original curatorial essay will accompany the show, as well as an affordable limited edition print produced in collaboration with the artist. A series of events including a catalogue launch, artist’s Q+A, and kid-friendly sculpture workshop will also be produced in conjunction with the exhibition. Check back for event dates and information, or subscribe to our blog for updates and invitations. Critical Distance Centre for Curators (CDCC) was founded in 2013 under our former name, TYPOLOGY. Established as a not-for-profit space devoted to curatorial and artistic experimentation, we devoted our first three years to providing opportunities for curators and artists to mount fully realized exhibitions within a critical framework. In 2016, we relaunched under our new name (CDCC) with a new Board of Directors and a commitment to meet the need, voiced by local and national curators, for a truly vital curatorial community—one that both supports emerging and underrepresented curators, and advances curatorial practice and inquiry. The Order of Things or, The Second Conference of the International Network of Personal Relationships (INPR), took place in CDCC’s exhibition space in 2014 under our former name, TYPOLOGY, and was curated by CDCC’s Founding Director, Shani K Parsons. Opening the same night will be Koffler Gallery’s next exhibition featuring Adad Hannah — enjoy two contemporary art events at Artscape Youngplace this evening! The Order of Things or, The Second Conference of the International Network of Personal Relationships (INPR), curated by Shani K Parsons, installation view with work by Leif Low-Beer, TYPOLOGY Projects, 2014. Leif Low-Beer, One way method (notes to notes), 2014, Mixed media on paper, 13.5 x 9 feet, in The Order of Things or, The Second Conference of the International Network of Personal Relationships (INPR), curated by Shani K Parsons, TYPOLOGY Projects, 2014. Leif Low-Beer, Misplaced desire, 2013, Mixed media, 43 x 38 x 64 inches, in The Order of Things or, The Second Conference of the International Network of Personal Relationships (INPR), curated by Shani K Parsons, TYPOLOGY Projects, 2014. Leif Low-Beer, The indefinite time period after the present, 2013, Mixed media, 56 x 48 x 68 inches, in The Order of Things or, The Second Conference of the International Network of Personal Relationships (INPR), curated by Shani K Parsons, TYPOLOGY Projects, 2014. Leif Low-Beer, The indefinite time period after the present (detail), 2013, Mixed media, 56 x 48 x 68 inches, in The Order of Things or, The Second Conference of the International Network of Personal Relationships (INPR), curated by Shani K Parsons, TYPOLOGY Projects, 2014. Leif Low-Beer, $2,505 eating out (4.01%) and $3,624 eating at home (5.8%) — (AAC), 2013, Mixed media, 48 x 53 x 60 inches, in The Order of Things or, The Second Conference of the International Network of Personal Relationships (INPR), curated by Shani K Parsons, TYPOLOGY Projects, 2014. Leif Low-Beer, The indefinite time period after the present, (detail), 2013, Mixed media, 56 x 48 x 68 inches, in The Order of Things or, The Second Conference of the International Network of Personal Relationships (INPR), curated by Shani K Parsons, TYPOLOGY Projects, 2014. Leif Low-Beer, $2,505 eating out (4.01%) and $3,624 eating at home (5.8%) — (AAC), (detail), 2013, in The Order of Things or, The Second Conference of the International Network of Personal Relationships (INPR), curated by Shani K Parsons, TYPOLOGY Projects, 2014. Leif Low-Beer, Perfect weather while facing a dearth of opportunities, 2014, Mixed media, 14 x 18 x 7 inches, in The Order of Things or, The Second Conference of the International Network of Personal Relationships (INPR), curated by Shani K Parsons, TYPOLOGY Projects, 2014. Leif Low-Beer, He could always dance through (no matter his state they never tipped), 2014, Mixed media, 25 x 61 x 13 inches, in The Order of Things or, The Second Conference of the International Network of Personal Relationships (INPR), curated by Shani K Parsons, TYPOLOGY Projects, 2014. Leif Low-Beer, Usually cleaned while they are empty, 2014, Mixed media, 25 x 70.5 x 6.25 inches, in The Order of Things or, The Second Conference of the International Network of Personal Relationships (INPR), curated by Shani K Parsons, TYPOLOGY Projects, 2014. Leif Low-Beer, Force per unit area applied in a direction (as it relates to one’s father), 2014, Mixed media, 9 x 14 x 6.25 inches, in The Order of Things or, The Second Conference of the International Network of Personal Relationships (INPR), curated by Shani K Parsons, TYPOLOGY Projects, 2014. Leif Low-Beer, exhibition catalogue, (detail), The Order of Things or, The Second Conference of the International Network of Personal Relationships (INPR), curated by Shani K Parsons, TYPOLOGY Projects, 2014. Leif Low-Beer, Artist’s sketch for One way method (notes to notes), 2014, digital print on matte poster paper, 18 x 24 inches, open edition, in The Order of Things or, The Second Conference of the International Network of Personal Relationships (INPR), curated by Shani K Parsons, TYPOLOGY Projects, 2014. Leif Low-Beer, One way method (notes to notes), 2014, Mixed media on paper, 13.5 x 9 feet, (view of the installation in progress), in The Order of Things or, The Second Conference of the International Network of Personal Relationships (INPR), curated by Shani K Parsons, TYPOLOGY Projects, 2014.